THE 15TH ANNUAL FREE COMIC BOOK DAY IS SATURDAY, MAY 7TH! Free Comic Book Day is the first Saturday in May each year — the day when comic book shops across North America and around the world give comic books away absolutely free to anyone who comes into the stores, no purchase required and no strings attached. The free comics are brand new and made specifically for this day, with comics for every age and interest represented. Free Comic Book Day is a celebration of comics, and everyone’s invited — those who already know how great comics are, and those about to find out! 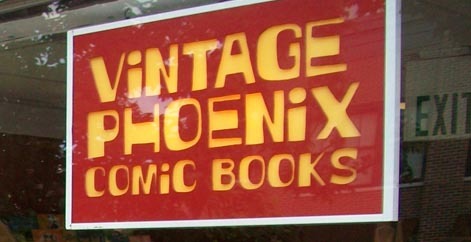 Vintage Phoenix is the destination for comics, graphic novels, action figures and more neat stuff in Bloomington. For 25 years we’ve been bringing great entertainment to readers of all ages and we’re always working to introduce new readers to the wealth of great comics available. With over 60 cumulative years of experience, our staff can help even the pickiest reader find something to read; heck, we enjoy the challenge! Whether you’re a weekly subscriber saving 10% off your comics just by picking them up regularly or a casual shopper taking advantage of our monthly half-price book, there are tons of ways to save while shopping at Vintage Phoenix. We have sales, free-with-purchase promotions, coupons, a great bargain room, and other ways for you to save money all the time. We also work with local community organizations like the Hoosier Hills Food Bank and the Monroe County Humane Association, and offer you a discount at certain times just for making a small donation. You’re giving back to the community, and getting something back at the same time! So take a look around the site and like us on Facebook too, that’s where we post a lot of news and deals. Feel free to email us with any questions or comments (link at the top of the page), we’re always looking for feedback and suggestions. We are here for YOU. We want to be your store. Stop in and check us out, we’ll do our best to earn your business and your loyalty! ©2015 Vintage Phoenix Comic Books.